[RECAP] You see the point the Lord is making? The heart is premier, the heart is #1, the heart is the primary issue…'and you My someday leaders, you the people to whom I'm going to turn over everything that I want to do, you must understand this! You must understand that the issue is the issue of the heart. That's why we end up against the wall of leader inadequacy. That's why we end up at the end of ourselves. That's why we're ready to quit. That's why we're ready to walk away from leadership. "Who wants this anyway!" Well, Jesus wants it for us. 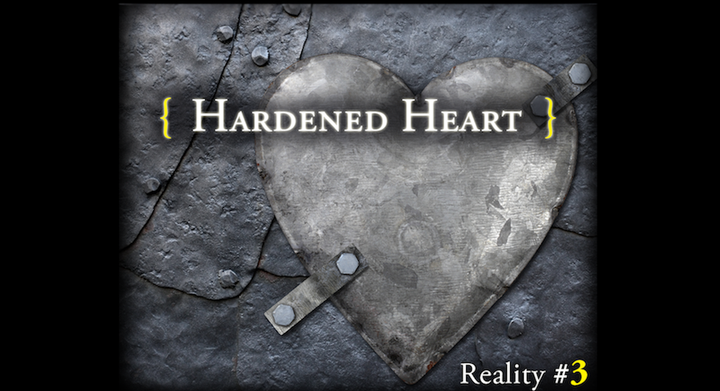 Because you see the only way our hearts can become His heart is as we come to the end of ourselves and are forced to face the reality we might have a hardened heart. Now Jesus follows this with four "Message Miracles." Each miracle is designed to send a message to the disciples. You have to understand how the Gospels were written. They were simply not a biographical presentation of Jesus. They were not written to be a day-by-day account of the life of Christ. They give us something of an account, but that's not their purpose. The purpose of the Gospels is to make a theological statement about the meaning of Christ's life. Not just the facts, but the meaning, the message, the aim, the purpose. And when Mark wrote his Gospel, he chose to organize it in such a way that it would come together and communicate a message. And before we are done with these Seven Realities of the Altered Heart you will get the message of Mark's Gospel and you will face a question that you must answer. Right now in His relationship with His disciples as we follow Jesus through Mark's vivid, virtual Gospel…this is almost like a video, you watch and you can see it….action, motion, movement, people, crowds, trying to get away from crowds, more crowds…discussion, conversation, correction, instruction, teaching, rebuke…all this going on with Mark's Gospel. Right now, Jesus is seeking to get with His men because He wants to teach them something very essential for their understanding of who He was. And so He wants to get away from these crowds, and so He goes and leaves Gennesaret on the northwest side of the sea of Galilee and He walks further up to the northwest out of Israel, the only time He went into totally Gentile territory, He goes to Tyre. Tyre is a city today on the coast of Lebanon. If you watch the news sooner or later you will run into it and hear about it because there are dramatic events happening in Lebanon and Tyre is involved. And so in Mark 7:24, Jesus left Gennesaret and He went to Tyre. And apparently He got a house, they might have short-term rented a place. So He entered a house and didn't want anyone to know. He wanted to be alone with His disciples. You see, in Mark chapter six, with the feeding of the five thousand Jesus changed His whole focus. He went away from the crowds as a point of focus and the disciples as spectators to the disciples as His exclusive point of focus and the crowd as spectators. And there were times He didn't want spectators around and this is part of that time. And so He goes into the house because He wants to teach His disciples. He has things He wants to teach them. He wanted to keep His presence secret but He could not do it. That's what the end of verse 24, Mark 7 says, verse 25 tells us, there was a woman who, as soon as she heard about Him…she had a little daughter, this woman. Can you catch the pathos in those words? Little daughter. I have five little grand-daughters. So beautiful, so precious, they're so sweet, they're so much fun to be around and what…how would I feel if there were a demonic presence that would somehow come into the life of one of my grand-daughters? That would devastate me! Well, that's what this woman was facing. She had a little daughter. Get the feeling? Her little daughter was possessed by an evil spirit, verse 25, and she came and fell at His feet. You know why? Because word about Jesus had spilled over the border. Now, in a border setting where countries are close to one another, things spill over, so that they know things about each other that further in each of the countries other people don't know. But they don't really, really understand each other. Not truly. They're not citizens of the same country. But nonetheless she had heard about, something about Jesus. And so she came in and she fell at His feet. Can you imagine what it would be like? They were seated at a table and she came in just bursting into the room and fell at His feet. She was a Greek. That made her a Gentile. But more specifically, she was Syrophoenician. Her background was Syrian and Phoenician. In other words, she was what you might call a "double-dip Gentile", she’s the real thing. There's no Jewishness in this woman. It's very important to realize that Mark who wrote the tightest Gospel of all, who wasted no words, makes the point…Syrophoenician. She begged Jesus. What she really did is she kept crying to the Lord, 'My little daughter has a demon, my little daughter has a demon, my little daughter has a demon,' and this went on for a few minutes as she cried out to the Lord. Oh my! Jesus called this Gentile woman with a little daughter who has great needs…He called her a dog. How can He be so harsh? How can He be so ugly? How can He do that?